What’s Really Driving Up the Nation’s Deficits? Earlier this week, we looked at whether tax cuts were responsible for reversing the downward trend in the U.S. government’s projected budget deficits over the next 10 years, at least as is being repeatedly suggested by the mainstream media in its reporting on just-released analysis by the Congressional Budget Office. The problem is not on the tax side. At all. If you look at the 10-year baseline, which is now infinitely more realistic post-extenders, you see that tax revenues bob around an 18% of GDP level. That just so happens to be right around the historical average for tax revenues, according to CBO. So taxes are coming in right on target, right where you’d expect them to. They are not, in other words, underperforming in any way. If the deficit is the sick love child of taxes and spending, the former is not contributing the corrupting genes. What is the problem? Why does the CBO project such large increases in the federal government’s deficits and the national debt? 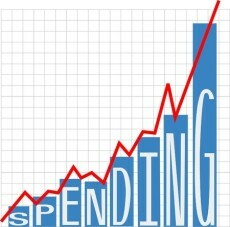 Over the ten year window, spending is set to grow from 20.7% of GDP in 2015 to 23.1% of GDP in 2026. That already puts spending above the CBO historical average, which is right about 21% of GDP. The long term baseline takes over from there. Spending grows to 23.5% of GDP in 2030, to 25.3% of GDP in 2040, and to 26.5% of GDP in 2050. It gets worse from there, especially if you take a peek at the alternative fiscal scenario spending baseline. 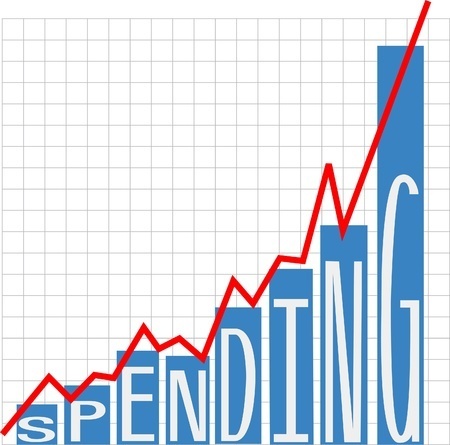 All of the growth in that spending comes from two sources: entitlement program autopilot growth for Medicare, Medicaid, Social Security, Obamacare and others; and the attendant interest spending on the national debt that comes from the entitlement-driven deficit scenario. The plane is coming in for a landing here. We have a growing deficit problem. We have shown that taxes are not only not a contributing factor, but that taxes are actually helping the situation. We have shown that spending is 100% of the deficit problem, and that entitlement spending is 100% of the spending problem. This isn’t that hard. If you’re concerned about deficits, the only thing you should be focused on is restraining the growth curve of entitlement spending. To the extent your focus is elsewhere (tax hikes, waste/fraud/abuse in discretionary spending, etc.) you’re being less than serious about your concern.